February is one of my favorite months. And not because it’s national potato lovers month, but you do you. It’s short, it’s usually a little dreary (well, in Texas it looks like freezing drizzle one day and spring the next – which makes me a tad cuckoo), but God brought two of my very favorite people into the world in the 2nd month of the year. Chuck on the 22nd and Allie on the 23rd. 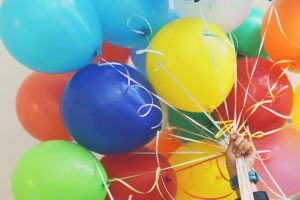 Because only 1 day separates their birthdays, Chuck usually gets forgotten amidst the hoopla and histrionics that surround my youngest daughter’s extravaganza. But not this year! My man turned 50 and his brothers did not disappoint. 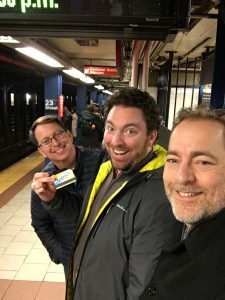 With the help of my deceptive mind and secret suitcase packing skills, his bros rang our doorbell at 7am in grim reaper costumes and exclaimed, ‘You must come with us now.” They then swept him away to New York City for an all expense paid weekend of fast paced fun, sight-seeing and culinary adventures. He was utterly surprised and completely delighted to spend 3 days with no responsibilities in the company of his best life-long friends. 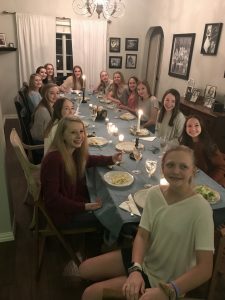 Not to be completely outdone, Allie hosted 14 of her closest 14 year old friends for a fancy dinner, movies and hang time in a pillow fort and a sleepover. This involved moving and rearranging the furniture in 3 rooms, fine china and crystal, and stringing Christmas lights from the ceiling. 14 year old girls are loud, but they are also sweet and fun to host. My girl is fortunate to have so many precious friends who wanted to help celebrate her. To quote the old program Wild World of Sports, the month started with “the thrill of victory” and ended with “the agony of defeat”. Such is common with youth sports. 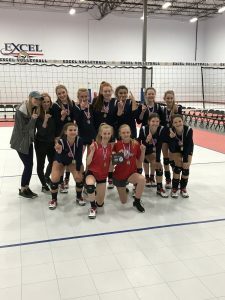 My daughter’s select club volleyball team won the North Texas Region Nike Bid Tournament for their division and secured their regional tournament bid one weekend, and 2 weeks later looked like they had never played together before. Sigh. But there are still several tournaments left for them to (hopefully) get their groove back. 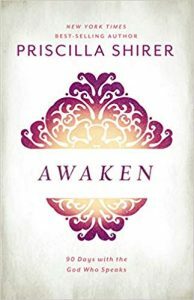 I’ve been studying Priscilla Shirer’s Awaken: 90 Days with the God who Speaks with my new Life Group. As a writer, I luxuriate in her use of language and research of scripture. And I’m privileged to be participating in two book launch teams right now. 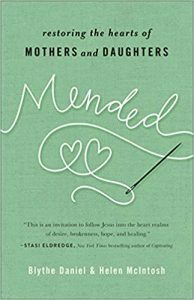 Mended: Restoring the Hearts of Mothers and Daughters by Blythe McIntosh Daniel and Helen McIntosh drops April 9. This subject captured my attention because parenting a teenage daughter is only slightly less challenging than swimming the English Channel with one arm tied behind your back. I want her to survive to adulthood with some love still between us, and I haven’t got the slightest idea how to accomplish that. 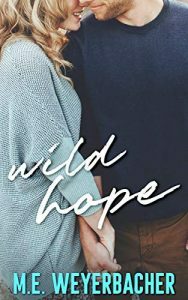 Wild Hope is my friend Meg Weyerbacher’s second small-town romance novel. I thoroughly enjoyed the first, but this one is even better! I have been training my brain with so much non-fiction lately that this sweet fictional story is breathing fresh air and restful calm into my soul. And I’m being thoroughly entertained! Wild Hope releases on March 7, but both books are in pre-orders now! Just click on the names of the books above for more info or to order. And don’t forget to check out the pre-sale for Perseverance: 30 Devotions for Faith that Moves Mountains. Read here for more details. 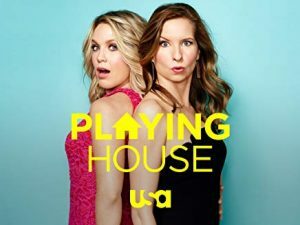 When I wasn’t reading, my best friend and I watched the TV show “Playing House” on Amazon together. And by “together” I mean I watched it in Texas and she watched it in Alabama and then we called or texted each other and laughed! It is a stupid kind of humor, that for some reason really appeals to me. 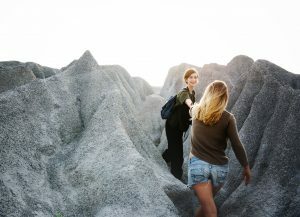 It’s an escape from everything hard and serious, but I was particularly drawn to the central characters – two best friends deeply devoted to one another. I have all kinds of romantic notions about best friendship – including the dream of one day living with Patsy again. Since we both have husbands and children it’s not looking likely. We did both marry slightly older men, though. So maybe we can Golden Girl it some day (but honey, if you are reading this, I want you to live a long, long time). I’ve also been imbibing in some self-help resources. I need all the help, from self or otherwise, I can get. I’m working through a free Blogging Made Simple course from Elite Blog Academy and watching videos from firstfriday.com/influence about the book Influence. I want to continually grow and improve my writing so I am ready for any mission God chooses to bring my way. I am also loving resources from axis.org. If you have a teen or love one, go immediately to their website. I’m currently watching a free Parenting Relationships Summit (interviews with experts in the field). I’m learning a lot that will help me preserve my daughter’s life in days to come. I also subscribe to their Culture Translator. In their own words, it is “weekly insight into how pop culture, technology and media are influencing your students while equipping you to start biblically based conversations. It’s so hard to keep on top of what are kids are exposed to since they have a computer in their hands at all times, but this has been so helpful for me. Back to friends, the highlight of my month was probably time with a couple of particularly sweet ones. I know girlfriend time is not an official love language, but I’m still pretty sure it’s mine. Coffee with one dear lady and dinner plus movie with another filled my love tank and brought me joy. I’d love to know what has brought you joy lately. Drop a comment here and join the conversation!